On February 28th, actress Angelababy (楊穎) ushered in her 30th birthday. 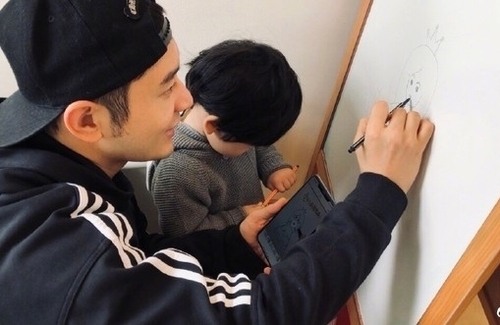 As always, her husband Huang Xiaoming (黄晓明) rushed to wish her a good one, and this year, he accompanied the birthday wishes with a photo of him and their son, “Little Sponge.” The father and son duo were creating a drawing for Angelababy, dispelling the divorce rumors. In the rare photo of Little Sponge, he was looking down at the pen he was holding and only his side profile was seen. In the past, the couple often shared Little Sponge’s pictures to update fans, but it’s been awhile since the last time he was featured in Angelababy and Xiaoming’s photos. Little Sponge has grown bigger, with pale skin and a head full of black hair. His cuteness and obedience, sitting by his father’s side, swooned netizens. 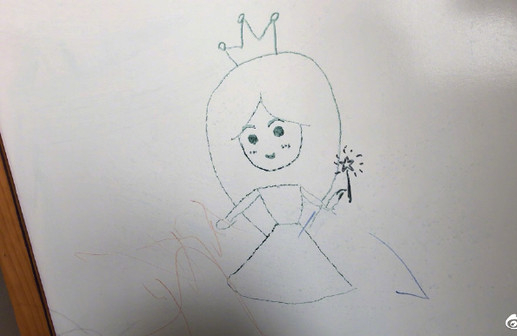 Meanwhile, Xiaoming was holding a pen drawing a princess with long hair and donning a crown. By the princess’ feet were some random marks, thought to be Little Sponge’s signature. The image shut down the rumors that began swirling around since the end of 2018 when Xiaoming was rumored to be unable to pay RMB 1 billion in taxes. Allegedly, Angelababy wanted a divorce to run away without fighting for Little Sponge’s custody. However, her staff denied the speculations. Angelababy also did not care for the rumors as long as it doesn’t affect her son. One thing’s for sure – the couple has been known for protecting their son’s privacy, especially to avoid any difficult childhoods.